We believe Sanctuary is a vision continuously created through decades of struggle, through thousands of years of struggle. We are working, organizing, reaching and yearning towards that vision – a vision of collective and personal transformation. We strive with fierce faith to build sanctuaries in ourselves as people and in our communities. All our work, campaigns and community building are part of a larger vision to build Sanctuaries within ourselves, our cities, and our world. 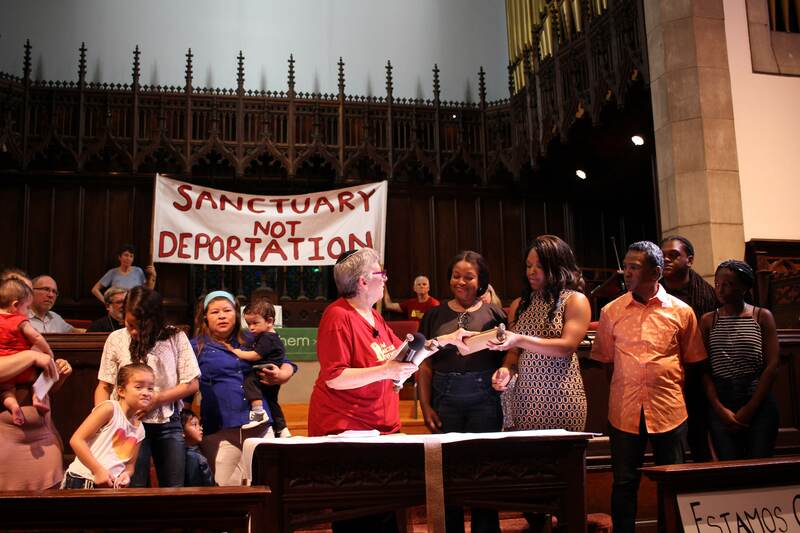 Since the election, the word “Sanctuary” has been a mobilizing force for thousands of people moved with renewed or newfound urgency for immigrant justice. It has served as a point of entry to varying levels of organizing in congregations, schools, cities, communities, and individuals. This disastrous political moment is also the birth of something big and beautiful and powerful. It is the birth of an expanded Sanctuary for everyone. We have seen more people come forward than ever before, and the vision of Sanctuary can hold these newly activated people. This is a vision defined and organized by undocumented people who have lived in the urgency all along. It is the birth of holistic organizing that invites the complete person into the movement for Sanctuary. This is the moment to build bridges with different communities and join forces. We see Sanctuary as the umbrella that covers all of us from the storm, and the womb to birth a new world. We are committed to the work of building not just a Sanctuary City, but a Sanctuary world. That work is ongoing and we stand in solidarity with all our brothers and sisters in this city and this earth fighting for collective liberation. Thank you all for all your hard work that is continuing to foster hope in our people. It’s been grueling for us, as we are sure it’s been for you all. But we are ready to rise to the challenge with you.